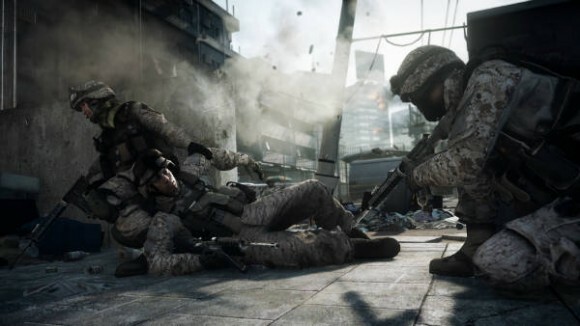 As many of you already know, Battlefield Premium is a service that allows die-hard fans to get more out of Battlefield 3. Much like Call of Duty Elite, it gives access to all past, present, and future Battlefield 3 DLC, allowing players to get in on new DLC a couple weeks earlier before non-Premium members. There are other bonuses, such as exclusive weapons and dog tags, but the early access to DLC is the main draw of Battlefield Premium. Battlefield Premium memberships run $50 a pop, but this Battlefield 3 Premium Edition is only going to cost $69.99 in the US, something that’s bound to make early Premium adopters angry. You’ve probably already figured out that Battlefield 3 Premium Edition comes with the currently available Back to Karkand and Close Quarters DLC packs (along with the upcoming Armored Kill, End Game, and Aftermath packs), but this edition also comes with a “Multiplayer Head Start Kit.” The kit includes 15 weapons, gadgets, and vehicle upgrades, so new players will be going into multiplayer with a little bit of an edge. So there you have it, Battlefield 3 Premium Edition is a real thing, and it’s coming next month. Electronic Arts says the game is launching in the UK on September 13, which makes us think that it’ll be releasing in the US on September 11. That’s just a guess though, as we don’t have an official US release date just yet, so keep it tuned to SlashGear for more information!